Ronan, Aurélien and Ewen are part of a team of daring surfers, fascinated by adventures in the open air. 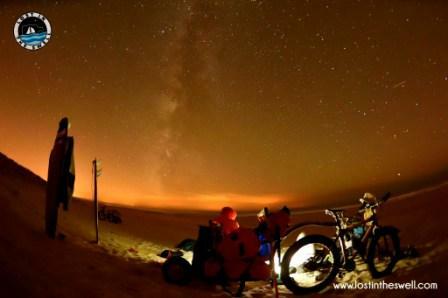 They have decided to go for a trip by bikes and surfs. 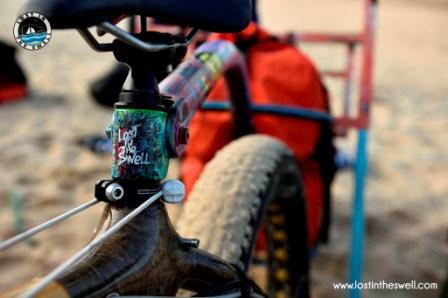 For this trip, they will travel with two Aevon bike trailers and fat-bikes to better stick to the beaches they intend to discover. This trip is not their first. They already have a first experience on a desert island and a boat trip around the Salomon islands. 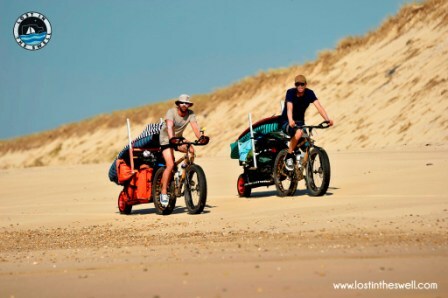 To carry tents, sleeping bags, wetsuits, clothes, surboards, a solar panel and cameras, they needed a trailer with a big loading capacity : the STD 100. ‘We chose this kind of trailer also because it has a single wheel. We replaced the rear wheel with a wheelbarrow wheel to better stick to the sand’. In all, the load reaches 45kg for each of the trailers, the maximum load recommended. This autumn, the team tested the material in Aquitaine, from Soulac to Capbreton : 300km of beaches and three weeks of pedalling and surfing. It’s only next July that the ‘real’ trip will take place in a foreign and savage country which they chose to keep a secret for now : ‘We maintain the suspense to the end’.